We learn in preschool that we have five senses. These five senses are how we experience the world, but they don’t work independently. 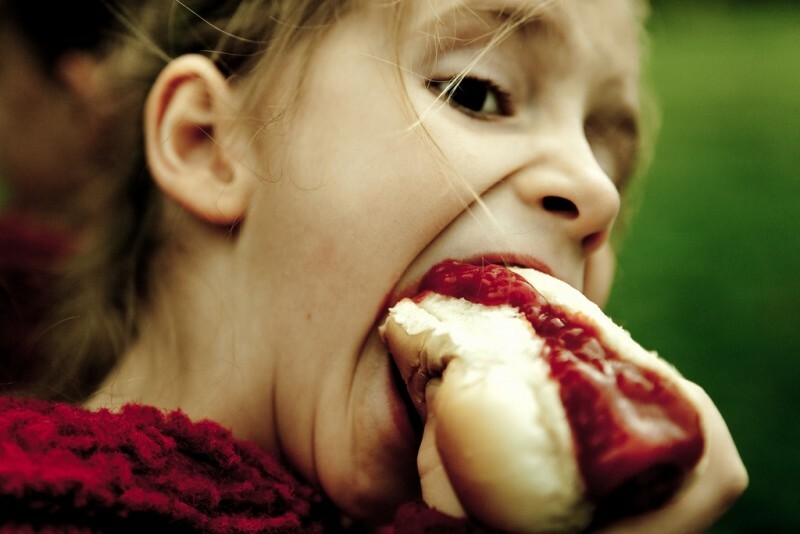 For example, the smell taste connection controls how we experience food. Yesterday, I was listening to a podcast with Danny Goldberg and Ben Cohen. Ben is the infamous Ben of Ben & Jerry’s ice cream. The interview largely focused on socially and environmentally conscious entrepreneurship. Ben also talked about his lack of the sense of smell and product development. His olfactory deficiency affects his ability to taste food, even ice cream. As a result, Ben developed ice cream flavors with different textures and fuller flavors. 1)http://www.mindpodnetwork.com/danny-goldberg-ep-5-ben-cohen/ It got me thinking about the connection between aroma and taste. I can relate to Ben’s lack of sense of smell. I also experience a weakened olfaction I think a result of growing up around second-hand cigarette smoke. This weakened sense was a blessing when changing dirty diapers but does it affect my ability to enjoy food? 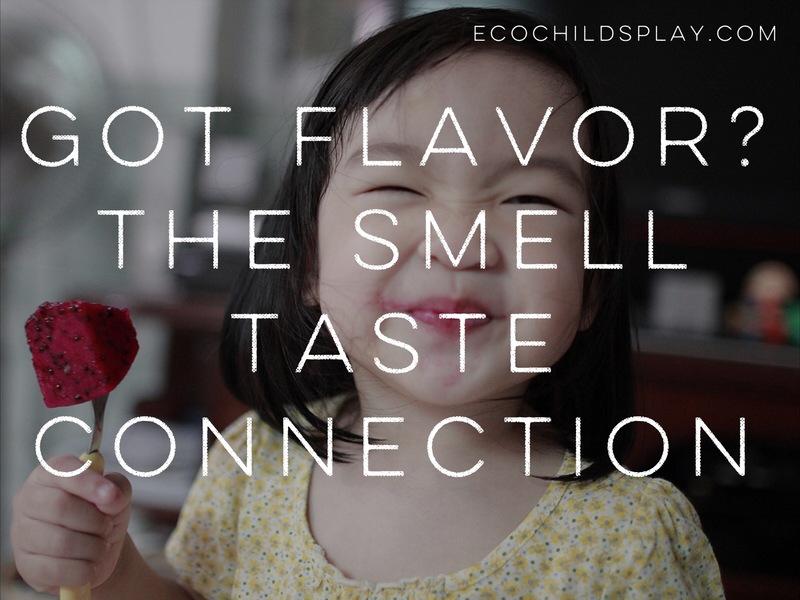 Just what is the relationship between our senses of smell and taste? What is the smell taste connection? Have you ever thought you were not hungry until you walked into a restaurant or kitchen and caught the aroma of food cooking? Beyond the ability to trigger hunger, olfaction, or the sense of smell, actually enables us to taste more flavors than our taste buds could on their own. Every person has between 5,000 and 10,000 taste buds. Each taste bud consists of 50 to 100 specialized sensory cells, which are stimulated by tastants such as sugars, salts, or acids. When the sensory cells are stimulated, they cause signals to be transferred to the ends of nerve fibers, which send impulses along cranial nerves to taste regions in the brainstem. From here, the impulses are relayed to the thalamus and on to a specific area of the cerebral cortex, which makes us conscious of the perception of taste. Airborne odor molecules, called odorants, are detected by specialized sensory neurons located in a small patch of mucus membrane lining the roof of the nose. Axons of these sensory cells pass through perforations in the overlying bone and enter two elongated olfactory bulbs lying against the underside of the frontal lobe of the brain. We were sent some Amoretti flavored syrups to try. This company has been making syrups for over 20 years. They are made from natural flavors. They are kosher, gluten-free, vegan, and GMO-free. There are a couple organic syrups too. Amoretti’s motto is “Our ingredients were not created for profit but for perfection.”5)http://www.amoretti.com/about_amoretti They also understand the smell taste connection. The Amoretti Master Sampler Pack contains twelve 1.7 fl oz (50 ml) bottles of Amoretti’s most popular products, grouped into four sampler packs containing three bottles each. 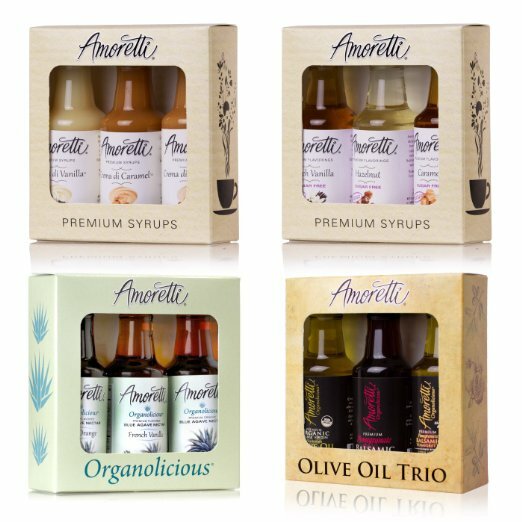 The Olive Trio set contains a 1.7 fl oz (50 ml) bottle each of Amoretti’s Organic Extra Virgin Olive Oil infused with the natural flavor and aroma of Kalamata olives, Amoretti Aged Pomegranate Balsamic Vinegar, and Vinaigrette. Look forward to drizzling the flavor and aroma of Kalamata olives over a finished dish, creating a sweet and tangy glaze for fish or poultry, and serving deliciously dressed salads. The Creamy Classics set contains a 1.7 fl oz (50 ml) bottle each of our three most popular creamy syrups: Crema di Vanilla, Crema di Hazelnut and Crema di Caramel. Transform your kitchen into a gourmet coffee house offering delicious flavored beverages, or ice cream parlor by serving the syrups over ice cream, topped with whipped cream and a maraschino cherry. The Sugar Free Flavorings set contains one 1.7 fl oz (50 ml) bottle each of our most popular sugar free flavors: French Vanilla, Hazelnut, and Caramel -containing half the calories and carbohydrates of our regular syrups. Our Sugar Free Flavorings contain no artificial sweeteners, allowing you to sweeten your cup as you please. These samples are small bottles, but you don’t use much. I have tried them in my coffee, and my kids have been sampling them in milk steamers. I wish more of the products were organic, but at least two of the sample product are from the organolicious line. The organic syrups are sweetened with blue agave. The little organic olive oil, balsamic vinegar, and balsamic vinaigrette will be great for camping. The smell taste connection brings us enjoyment as we consume foods and beverages. Premium syrups are a quick and easy way to take advantage of this relationship between our senses.